Clear-Com launched HelixNet Version 3.0, a free software-only update to the HelixNet digital network partyline platform, LDI 2015. The new version allows the HelixNet system to address the need for more communication channels to support live performances and live productions. With this new update, the HelixNet multiplies its basic channel count by three, with a new offering of 12 channels per HMS-4X Main Station. In the previous version, users had to link three HMS-4X Stations together in order to achieve the same number of channels. This capability brings greater capacity and flexibility to larger productions that require more distinctive talk groups. 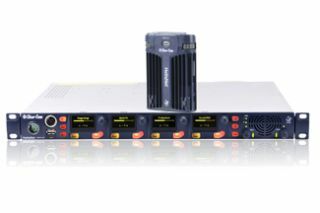 An additional 12 channels can be added simply by purchasing a license, effectively enabling a single HMS-4X to provide a total of 24 channels. In order to support this expanded channel count of HelixNet, any combination of Main Stations or Remote Stations (HRM) can be configured to function as expansion key stations. With multiple devices acting as one system, users are able to address all users on HelixNet with a single headset/mic/loudspeaker. Pressing the “All Talk” key will affect all channels in a linked and expanded system. HelixNet 3.0 also features a free browser-based software tool for the first time, the Core Configuration Manager (CCM), which enables easy online setup and configuration of all HelixNet devices via the latest versions of all major browsers on Mac, PC, and tablet platforms. CCM offers visual representation of all connected devices and functions, and the save/restore function allows easy duplication of systems. All configurations can be edited via the CCM software, or via the traditional menu system on the HelixNet Main Station.